On Wednesday I covered the construction of a collarless, open coat (what could be easier?) for my daughter Esme. The post drew lots of positive comments – thank you! It is interesting how yellow seems to be a colour that many home sewers avoid. I think it maybe because many people worry about finding a yellow that suits them. Anyway I met someone very interesting yesterday who made a yellow coat on TV (Great British Sewing Bee, series 2)! Her name is Tamara and here is her yellow coat. Tamara told me that she was given all her Mum’s old 1960s and 1970s patterns and this coat pattern was one her Mum had made and worn in the 60s. What a lovely woman, and what a lovely coat. Back to my coat which should be a quick job as it doesn’t have buttons or a collar. I am pledged to finish this by Saturday (part of my Made Up pledge) so i need to get on with it. After checking for size and fit I completed the pockets, stitched up the body pieces (six panels with some shaping in the back seam) and underlined the facings with cotton organdie. I felt this was just the right fabric for giving some body and crispness without overwhelming the coat. I made up the sleeves and basted one of them into the coat, ready for the second fitting. and explained I had chosen something suitably light. She examined the organdie and pronounced it very “crisp”, which is absolutely true. She produced the original Zara coat and we pulled it around and found that, as she had thought, it lacked interfacing. There was seam binding only, plus a little bit of sleeve head roll. That surprised me, but then it is a coat that feels like a cardigan. And there is always so much to learn from RTW. But, in my view, not having any support means the coat will start to look crumpled and droopy after a few wears. So, against my better judgement, but knowing that she knew what she liked about the old coat, I removed the interfacing. Luckily I prefer to sew in my interfacing rather than use an iron on product. The second picture (above right) shows what a difference it makes. At the second fitting I checked the length of the coat. I made the coat as long as I could given the shortage of fabric and the marks on the remnant. 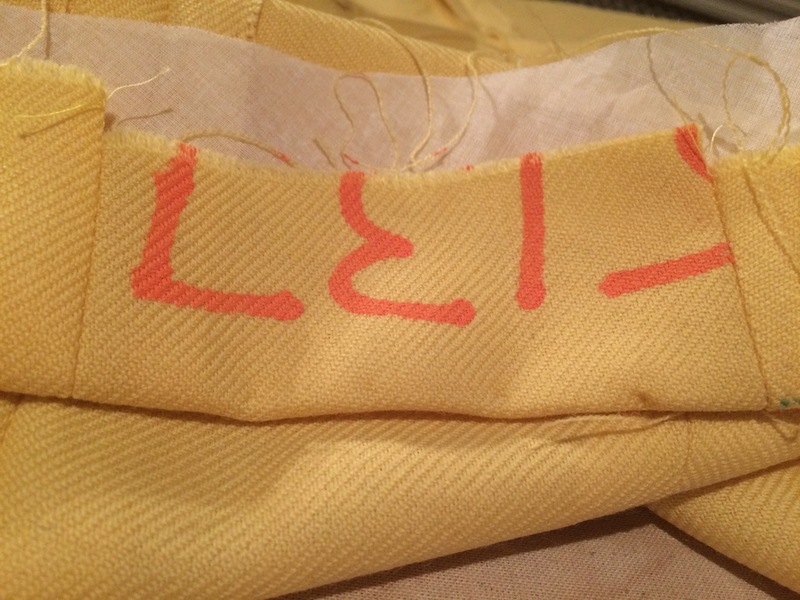 The hem now encloses the end of the bolt marks. I could have cut it off but I wanted to hide a little bit of its history in the hem. I did use a strip of bias cut organdie in the hem as I usually do, but left it out of the sleeve hems to give them the softness that Esme requires. In fact I cut 7cms of the hems of the sleeves – they were really long, or perhaps we are short-armed women? All I have to do now is make a lining and finish it by Saturday. I had considered buying some yellow silk, but this has been vetoed. Esme has other ideas. Here is the inspiration. It is going to look smashing. A marbled lining would be neat. Esme knows what she does and doesn’t like. I wish I had that certainty (plus a Mum who could follow my bidding as well as you do). It is going to be great. I love that fabric. I remember Tamara. She made some fun outfits. Great coat, I know that the un interfaced finish was what your daughter wanted but I do prefer the crisper finish it gives. I can’t wait to find out how you are going to marble the lining. 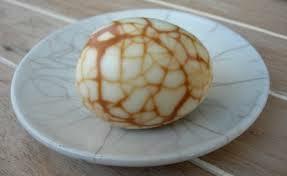 That egg looks amazing. I love the inspiration for the lining – I think it will look ace – and am looking forward to how it translates – batik or shibori perhaps? Well, my first thought was that your daughter is very picky. But on second thought, why shouldn’t she get exactly what she wants from a home made coat? Isn’t that one reason why we sew? I don’t know how your are going to pull a marbled lining out of your hat (or your sewing stash), but that is a gorgeous inspiration. It frightens me to think of wool with no interfacing! How funny. I do have a wool twill jacket that I didn’t interface much and it is quite soft, but I worry that it will not last long. I think the coat looks great, and I can’t wait to see the lining. I am loving this series Kate, as I have plans to sew a very similar coat in blue. I love to look at that sunny yellow but not next to my skin. I am more a mustard yellow but I don’t enjoy looking at it. If I saw Esme walking down the street in that coat I would smile because the color is lovely and the style is jaunty and carefree. And all your travails with linings is helpful to me since I am in the Esme camp and prefer a less structured coat on my body. I love to look at highly structured Valentino and Dior coats but just can’t stand to wear them because I feel like I am in an armature and need rescuing. Onward to lining! I agree with you Mary that comfort is paramount, but a nice silk lining and a light weight wool feels pretty yummy and gives a bit of warmth. The coat is coming along well, even if not in the direction you wanted! Yes, Esme sounds like my youngest daughter! She (daughter) could wear yellow, or more likely mustard but as a cool season I can’t although I had a bright yellow jacket at university, which I loved. I think your cool colouring is very similar to mine Anne, and I would say a clear, cool lemon, or true yellow would look great on you. I think you can wear fairly strong brights, so don’t turn your back on yellow. Maybe just a top? Or a skirt? Esme’s coat is very similar to one my grandmother made me around 1962 when I was 17, made from a shantung-look pink fabric with a single large button at the neck. It was for Easter Sunday and I wore it with short white gloves and a pillbox hat, as I recall. After all, we dressed up for church in the South (Louisiana!) Thanks for bringing back fond memories of the grandmother who taught me to sew! Thank you for sharing a lovely story. I can just see you in that pink coat with a hat and gloves. Very formal but quite wonderful to have a chance to dress like that. I am sure today’s kids are comfortable in jeans and trainers, with T shirts and sloppy jackets, even for going out. We had a very interesting time in New Orleans a few years ago. It seemed to have a culture of its own. Do people in the South still dress up fo church? Perhaps the interfacing solution would be a cotton muslin. You still have a layer of interfacing for stability yet not that crisp finish that Esme dislikes. I assume you used organdy and not organza. Most organdy I’ve seen is very crisp and might not be the best choice here. Try bias strips of muslin or organza in the hem; might be softer yet give some body. I love the bolt markings hidden in the hem. It adds a unique touch. Alexander McQueen was known for his hidden markings in garments. The lining idea sounds wonderful and I’ll be watching for what you choose. Yes. You are right Mary, as ever. The organdy was too crisp. I feel rather disatisfied with it as all the workings can be seen (which wouldn’t have been the case if it had been under and interlined, and lined with yellow silk), it is a bit too flimsy and it is not the coat I would have liked. But it is probably a good compromise. The generations have different ideas of comfort, and style. I have nothing to add other than that I found the comments interesting. Mary’s comment about Alexander McQueen is interesting and I like her idea about a lightweight interfacing. Lucky Esme! You are so right about yellow. I made a wearable toile in yellow last month and have worn it to death. On the hunt for yellow woollen knit. How do I keep it clean??? That is the key question April and why I think yellow tends to be used for “occasion” wear only. Esme’s old yellow coat became very grubby, and this one will too I imagine. I blame those floppy jersey jackets and blazers that have entered the fashion world in recent years and have somehow become the desirable norm amongst the younger generations. But you know what? This client-daughter/sewer relationship is ringing bells! Yes Sew2Pro, I think it is comfort over longevity, but that is just a sign of the times. I hope we haven’t raised too many prima donnas!